“Arnulf Rainer for digital performers” is an installation that reenact the Peter Kubelka’s film: Arnulf Rainer. This experimental film is based on a composition of black and white frames that creates a stroboscopic rhythm formed by the essence of the cinematic image: light and its variations. In order to achieve his aesthetic intention, Peter Kubelka designed a score that was impressed on the film to be executed by the cinematograph. “Arnulf Rainer for digital performers” is based on a software that analyzes and remakes the Kubelka’s composition in the real time, in order to extract the color (black or white) for each frame. After this process, that is ran on the main computer (director), the status is sent to a devices ensemble (players) to perform the composition. 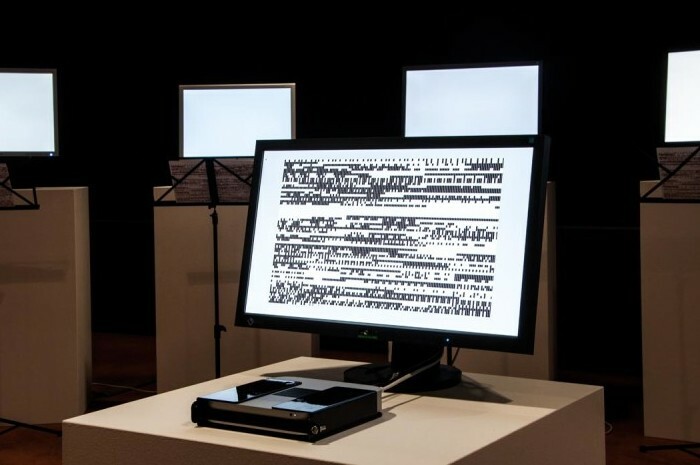 As well as in a concert, each of these digital systems interprets the commands suggested by the director, by means of its own technical qualities. The aesthetic properties of each medium emerges, underlining its own identity, in opposition to their usual function of contents provider.